- We will confirm your potential BAL rating. - We will give advice on how to lowering your rating. - We will answer all of your questions. If you wish to proceed we will then issue a written quote with a lowest price guarantee. Bushfire assessments are undertaken in areas that have been deemed bushfire prone and are used to rate and minimise the potential risk of bushfire to buildings. Once an assessment has been completed owners are faced with the decision to clear vegetation to lower the risk or upgrade the construction requirements to the building so it can withstand bushfires. Building that have been constructed to comply stand a much greater prospect of offering shelter as the fire front passes. 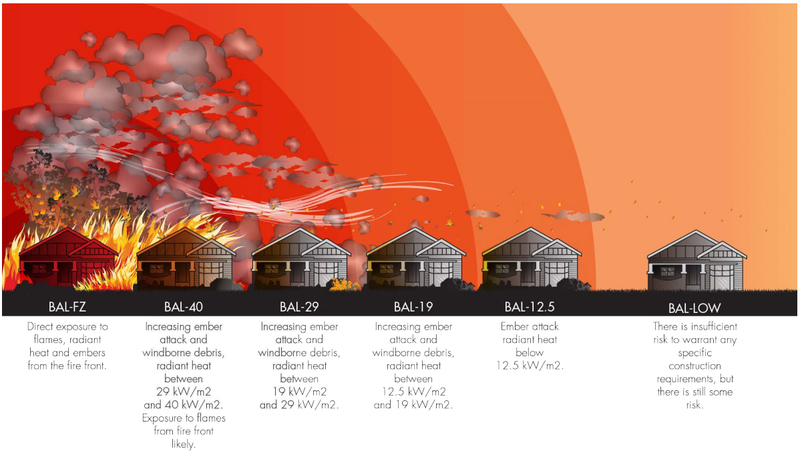 Even the bushfire attack level of 12.5, the cheapest upgrade allows for full amber protection and 12.5 kW of radiant heat exposure. Bushfire assessments give rating on how the site presents on the day of assessment, No future works can be taken into consideration when ratings are calculated. Sites should be prepared to reflect the true risk to the dwelling. Grasses should be cut to under 100mm and surrounding vegetation should be landscaped. You should always notify us of any plans to modify or plant vegetation as it can increase the risk to your dwelling. "how much vegetation can be retained. The reason we purchased the rural block was to live among the trees." Potently a building can be constructed to FZ (Flame-Zone) rating, this means the threat is deemed so high that the building will have direct flame contact. This solution is undesirable and will be rejected by shires without mitigating factors. All sites should be constructed to allow for a defendable space around the building. This area can contain trees and shrubs but they should be spaced out with no understory. Our bushfire reports comply with AS3959-2009 and will be accepted by all shires in Western Australia. Why would you risk getting a HIGHER BAL rating with another less experienced assessor? In the life of any given project delays quite simply equal loss of money, our primary focus when undertaking any project is to understand the time restraints placed on that project. All quotes include an additional report outlining the requirements to lower your BAL rating, potentially saving $10,000 or more.